Make an impression with your packaging and your brand. Custom Kraft Tape and Custom Printed Carton Sealing Tape put you in the category of online shopping channels like Amazon. High quality and only the best materials to ensure your packages arrive safely. Custom printed paper tape is kraft paper with water activated glue that can be used with a Better Pack Tape Dispensers! Available in both Reinforced and Non-reinforced Kraft paper. 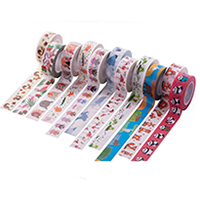 Custom Request for Quote allows you to tell us exactly what type of tape you want to use like Acrylic Tape, Duct Tape, Masking Tape and others with your killer design that makes you stick out. Most common adhesive for custom packaging tape is hotmelt. Pricing is for one color and two color printing not including plate charges. Artwork printed approximately every eight inches. Custom printed kraft tape is a great way to make a statement while sending out all of your packages. Available in both Reinforced and Non-reinforced Kraft paper. Pricing is for one color printing on Kraft fiberglass yarn reinforced or White fiberglass yarn reinforced paper tape. 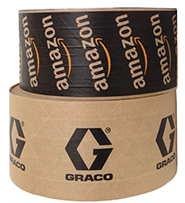 Most custom tape is made from kraft paper with a water-activated adhesive or from BOPP with a hotmelt or acrylic adhesive. Select from our list of common sizes and styles above or tell us what the scope of your project is and your requirements on our RFQ form. Next tell us who you are so we can follow up with great customer service. If you really want to make your order stick... At the end of submitting your quote information you will be asked to upload your artwork and/or logo. One of our knowledgable reps will follow up with you to introduce herself and get your tape order rolling.